Most people know that cracks in their windshield need to be repaired, but a lot of people are okay with the idea of leaving a passenger or driver side window damaged. They reason that this damage isn’t going to affect the safety of the car and that replacing it will be too expensive to justify. However, these windows are extremely important to the safety of the car and everyone inside of it as well. The side windows on the car are actually connected to internal, computerized parts that are important to the workings of the car. When the windows are damaged or not working, these parts may be exposed tot he elements or may be operating incorrectly. After a while, they may start to break down and cause more damage to the car as a whole. They may even start to fail completely, causing massive safety concerns that cannot be seen as they are hidden within the door. However, this kind of damage is somewhat rare, and the biggest danger from damaged windows is to the passenger or the driver themselves. Windows are designed to be a nearly perfect barrier between people and the outside world. They are meant to keep people from being harmed in minor accidents, and from being exposed to the elements when going at high speeds. When they are damaged, there is a chance that they will break while the car is operating normally, and a very high chance that they will break if it is involved in an accident. Many times, the cause of these damages is from human carelessness. Slamming doors, leaning against glass, dropping things, or even leaving windows rolled down when it rains can all cause damage. Other causes are rocks thrown from other cars, hail, and other natural elements. No matter how the vehicle is damaged, the solution is almost always going to be the same – replace the window. Damage can range from small cracks to large ones, from chips to broken pieces, even scrapes from internal parts are possible. Some of these things may be repaired, but most of the time, replacing the window is an easier solution. Except for the smallest of cracks and chips, repairs are usually going to cost more than replacements. However, replacements are usually under $200, making them much easier to stomach than replacing a windshield. Once taken to a qualified window shop, the replacement or repair should only take a few hours at most. Many times repairs can be done on a lunch break if an appointment has been made. The process of replacing this glass is actually quite easy. 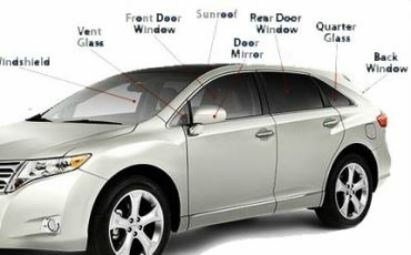 Calling ahead to mention the make and model of the car as well as the window that has sustained damage will make the entire process much easier. A lot of the time, this type of repair is actually covered by insurance as something preventative as well. Talk with the car passenger and driver window replacement technician you choose to see if they are able to work with your insurance.